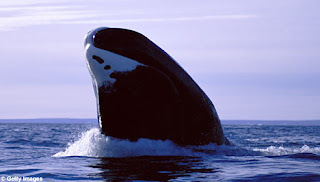 The bowhead whale (Balaena mysticetus), the original paradigm of baleen whales, now unfortunately one of the most endangered whale species. Photo from here. This week's Taxon of the Week post is the biggest yet. 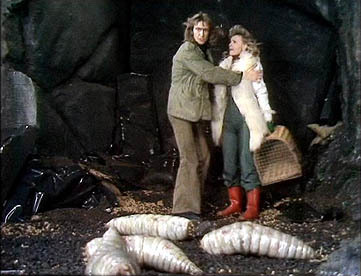 And while that is (as you shall see) an absolutely gods-awful pun, I just couldn't resist it, because my topic today is a group of animals that really can't be discussed without at least some reference to size - the Mysticeti. Mysticeti are the baleen whales. The name can actually be translated as "moustache whales", which makes them sound like the Groucho Marxes of the whale world. Like Groucho Marx, that's not a real moustache. Unlike Groucho, it's not painted on with greasepaint. The baleen of baleen whales is an array of bristle-edged plates coming down from the outer margins of the palate and which the whales use to filter food out of the water. Baleen whales are usually referred to as plankton feeders, but different species are actually specialised towards different foods. The smaller rorquals, for instance, tend to prefer fish, while Dale Rice apparently examined two sei whales (Balaenoptera borealis) (out of a catch of 39) at a whaling station in California in 1959 that had only rudimentary, non-functional baleen and yet appeared to be in perfectly good health with stomachs full of anchovies (Watson, 1981). 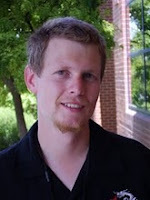 Darren Naish wrote a series of posts some time ago on one group of baleen whales, the rorquals, that you can read here. Whales are such seemingly familiar animals, which species listed in so many popular books, that it may come as a surprise to some that the taxonomy of whales is actually a rather shaky affair, as exemplified by the description of Balaenoptera omurai as recently as 2003 (Wada et al., 2003). Minke (Balaenoptera acutorostrata), blue (Balaenoptera musculus), Bryde's (Balaenoptera edeni) and great right (Balaena glacialis) whales are all representative "species" that are split or lumped to varying degrees from author to author. 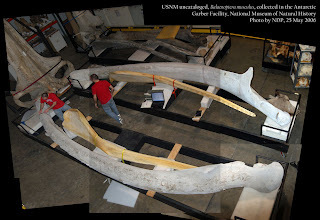 The sheer size of baleen whales and their marine habitat makes comparison of specimens a logistically daunting affair (see the photo above by Nick Pyenson, via Matt Wedel, of a blue whale jaw, with skull propped up against the wall in the background), and such specimens few and far between. After all, it's not as if a full-grown sei whale (let alone blue whale) can be popped into a vial of ethanol for preservation, while any sort of dissection is liable to require a forklift or crane, a stepladder, and a chainsaw. A large portion of the taxonomic research on whales has been based on strandings, but these carry their own potential sources for error. For instance, colour pattern or body conformation may become altered or distorted post mortem, and more than one cetacean has been inadvertently restored as an animated corpse. Reconstruction of the Oligocene toothed mysticete Janjucetus hunderi, one of the most basal known mysticetes. Image from here. The fossil record of mysticetes dates back to Late Eocene, where they are represented by Llanocetus denticrenatus (Steeman, 2007). Not too surprisingly, these early mysticetes retain teeth. In another incarnation of the ghastly Great Chain of Being metaphor that has haunted popular presentations of evolution and sadly refuses to die*, the toothed mysticetes are often implied to been nothing more than steps on the path to the modern baleen whales. 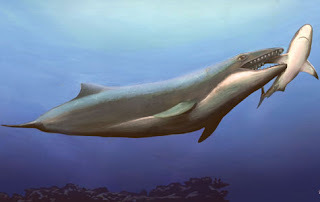 In fact, the Late Oligocene played host to both early representatives of the clade Chaeomysticeti, the toothless baleen whales, as well as a number of toothed mysticetes, including Janjucetus hunderi and the Aetiocetidae. Seeing as Llanocetus is more closely related to the Chaeomysticeti than the latter two taxa, the lines leading to these taxa must have been in existence since at least the Eocene. * Which brings up the question - is it possible to be truly haunted by something before the haunter is dead? Outside the crown clade of modern mysticetes, but within the Chaeomysticeti, were the Late Oligocene Eomysticetoidea. Eomysticetus whitmorei is known from a large portion of a skeleton from South Carolina (Sanders & Barnes, 2002). With a skull about one and a half metres long, E. whitmorei wouldn't have been a spectacularly large whale, perhaps comparable in size to a modern minke. The really interesting thing about Eomysticetus is that it retains a number of primitive features not found in modern baleen whales. One of the significant features of the cetacean skull has been the process of telescoping, where the lower part of the skull has been extended forward while the top part has receded back, resulting in modern cetaceans having the nostril(s) (the blowhole) positioned more or less (depending on taxon) directly above the eyes. The archaeocetes, the paraphyletic stem group to modern cetaceans, largely lack this feature, though the beginnings of it can be seen in more derived forms. In Eomysticetus, the opening of the nostrils would have been positioned about a third of the way down the rostrum, far closer to the front of the skull than any modern mysticete. Between Eomysticetus and early fossil odontocetes, the indications are that while the process of telescoping began in the archaeocetes, it was actually brought to culmination independently in the mysticetes and odontocetes. What is more, Eomysticetus also possessed a less telescoped skull than the toothed Aetiocetidae, suggesting that the Aetiocetidae represent a third lineage to have converged on the telescoping trend - and adding to the point that the toothed mysticetes were not evolutionary no-showers even after the appearance of the baleen whales! Sanders, A. E., & L. G. Barnes. 2002. Paleontology of the Late Oligocene Ashley and Chandler Bridge Formations of South Carolina, 3: Eomysticetidae, a new family of primitive mysticetes (Mammalia: Cetacea). Smithsonian Contributions to Paleobiology 93: 313-356. Steeman, M. E. 2007. Cladistic analysis and a revised classification of fossil and recent mysticetes. Zoological Journal of the Linnean Society 150: 875-894. Wada, S., M. Oishi & T. K. Yamada. 2003. A newly discovered species of living baleen whale. Nature 426: 278-281. Watson, L. 1981. Sea Guide to Whales of the World. Hutchinson: London. Wow, so telescoping evolved in parallel in three lineages? Is anything known about the evo devo leading to telescoping? Is anything said about selective hypotheses other than the obvious - a blowhole on the dorsal surface makes it easier for the whales to breath? Chris, do you have the paper about the fossil whale with teeth AND baleen? I forgot all about it until reading this post. Slybird: Yep, telescoping evolved independently in three lineages (or at least two - I suppose there's an outside chance, though I suspect it's unlikely, that the longer nasals in Eomysticetus are a secondary reversal). I don't know the genetics behind telescoping or anything, but going by the Tree of Life page for Cetacea it seems to be more a matter of lengthening the jaw bones such as the maxilla. This page has a series of a few skulls showing what I mean. My guess (and it's only a guess) would be the same as yours - that telescoping allowed for easier breathing. Zach: I did recall something about a whale that had both, but i don't have a source. Digging around on Google, it looks like the animal in question was Llanocetus, which makes sense as despite being one of the earliest mysticetes Llanocetus is the closest known relative to the Chaeomysticeti. From memory, it doesn't have baleen preserved (being keratin, baleen would be unlikely to fossilise) but it does have jaw structures that look like they could have supported baleen. Odontocetes are way more diverse than mysticetes - the ziphiids and delphinids both contain more species in a single family than the mysticetes in total - but they're certainly not as monotonous as you might think.